There are many ways to make a peptide bond, which is one of the most ubiquitous linkages known to man. Regardless of the biosynthetic or synthetic origins of a particular process, the acid component is turned into a better electrophile during peptide bond formation. DCC couplings and active ester technologies do this job for countless chemists around the world. If you look at the active ester method, you will note that there is one major way of producing active esters: using the red disconnection marked below. But what about an alternative pathway shown in blue? 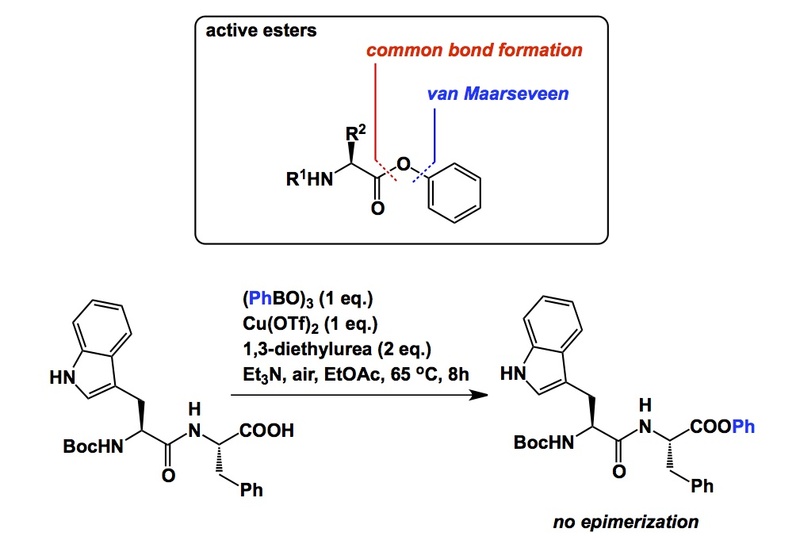 This is a viable option, yet no one has thought of it prior to Jan van Maarseveen’s recent work in Chem. Eur. J. I talked with Jan about this project during my trip to the Netherlands this past June. The reaction is an “outside the box” way of looking at problems, which prompts “Why didn’t I think about this?” kind of question. Really, when you first consider this idea, you expect that it must have been tried prior to 2013 by the legions of synthetic chemists eager to test new substrates in coupling reactions. As it turns out, Jan was the first one to think about this application and reduce it to practice. My complements. Of note is the configurational stability of the alpha-stereocenter during the coupling reaction. This chemistry should open up many new synthetic possibilities.